468 Vista Verde Road is located in the popular area of Mustang Mesa, approximately 10 miles north of Bishop on Hwy 395. 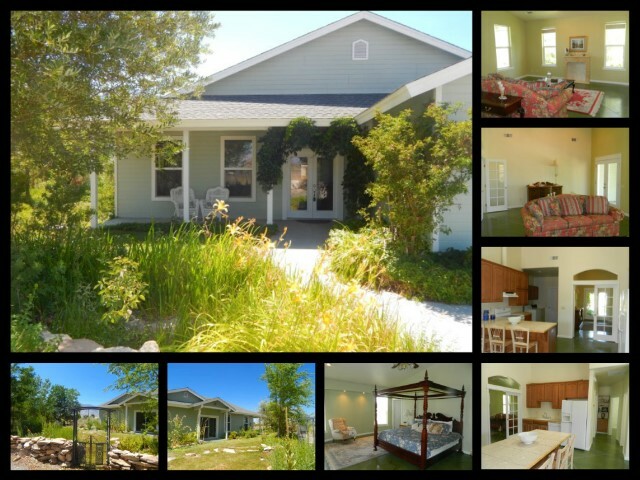 This beautiful 3 bedroom 2 bathroom home was built in 2003, and is perfect for you if you like being off the beaten path. Located at the end of a cul de sac, down a private curved driveway, you get extra privacy. Once you enter the home through the French doors, the vaulted ceilings, recessed lighting, large windows throughout, skylights in the kitchen and dining areas give the home a light and bright feeling. The stained concrete floors throughout give an artistic and one of a kind feel. The master bedroom, which you enter from a set of French doors, allows room for a king size bed and furniture with room to spare. The master bathroom includes a massive shower and plenty of cabinets for storage. The master walk in closet provides generous amounts of shelving and hanging racks. Two additional rooms are located on the east side of the home. The guest bathroom has a one of a kind claw foot tub, for those needed relaxing nights. Sitting on almost ¾ of an acre, you have the best of both worlds. The east side of the property is landscaped including shrubs, lilies, trees and much more. The west side of the property is more untouched and ready for additional parking, horse barn/stalls or garden areas. The back covered patio offers a sitting area to watch the breath taking sunsets. Cool summer breezes bring hints of fresh mint in the air, which is growing near the pond on the East side of the property.